Stuck for gift ideas this Valentine’s Day? Want something more than just the usual flowers and champagne? An innovative campaign by a Melbourne small business could solve your dilemma. For a limited time in the lead-up to Valentine’s Day, pop-up cafe The Brownie Bar is giving locals the chance to design their loved one the craziest, sweetest, most decadent personalised brownie they can come up with. 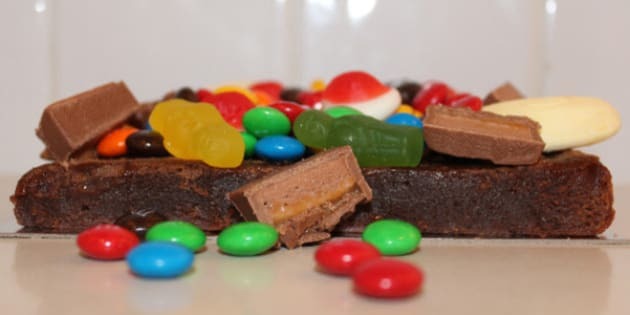 The Brownie Bar owner Julie Cooke said from today until Valentine’s Day she is taking orders for the custom 11cm x 16cm brownie blocks which can be ready to collect in 48 hours. Cooke said she came up with the idea for The Build-A-Brownie-Block campaign after being inspired by her customers. “I have had some insane requests from my customers so I thought instead of choosing all the brownie flavours myself -- why not let the customers create their own?” she said. Customers choose a base: classic, gluten free or vegan, and then choose from one of 12 base flavours that include classic, chilli, espresso, gingerbread, mint, nutella and salted caramel. Customers then choose up to four toppings from an extensive list that includes jelly beans, Mars bars, Malteasers, musk sticks, pretzels, popping candy, skittles, sour patch kids, fairy floss and fresh raspberries and blueberries. See the full list here. Julie Cooke is handing creative control of her brownie range to customers in the lead-up to Valentine's Day. Cooke said she was open to negotiation when it came to toppings not on the list. “If they want something else, I can definitely talk to them about it,” she said. “I’ve had some weird requests, more when it comes to the Brownie sundaes -- like raspberry brownie with lime gelato and salted caramel topping,” she said. Cooke said the campaign was also a way to thank the cafe’s customers for their patronage before the pop-up closes on Valentine’s Day. She started her baking business in 2011, selling goodies at local farmer’s markets and events, and opened the short-term pop-up cafe to gauge wider interest in her product. Through the experience Cooke has honed in on a marketing plan, now focussing her efforts on selling wholesale and at local markets, music festivals, weddings and corporate events, giving her greater flexibility and fewer overheads. One of The Brownie Bar's custom creations featuring Persian fairy floss; and one of their regular range. “We’re looking now at doing some of the bigger markets and festivals and events and build up the wholesale,” she said. “We’ve got quite a few clients that are jumping onboard the wholesale side already, so that could do really well. In addition to being able to build your own brownie block, up until February 14 The Brownie Bar will continue to sell more than 20 flavours of hand-baked, hand-cut brownies, as well as a range of brownie desserts, brownie shakes, gelato, ice-cream sandwiches and brownie sundaes.